Many bloggers write a “Books I Read Last Year” or “Recommended Movies” post at the end of the year. Frankly, I think most people do it because other people do it and because they’re really easy to write. It’s a total cop-out for generating content. In fact, it’s such a good cop-out that I’m going to do it, too. It’s still a nice way to review the past year and share what I did. Here are the some things that I loved from 2018. Try out “College Contagion”, my one-page RPG! Author kevinPosted on August 5, 2018 August 4, 2018 Categories tabletop gamesLeave a comment on Try out “College Contagion”, my one-page RPG! 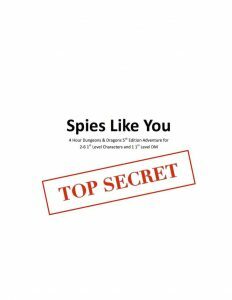 Author kevinPosted on December 18, 2017 December 26, 2017 Categories goals, projects, tabletop gamesTags DnDLeave a comment on “Spies Like You” is published!